Are you using Instagram for business? Maybe you are selling your products on Instagram, or you are collecting data like engagement on Instagram, meaning followings, likes etc. Or maybe you are an influencer? You’ve noticed that, almost overnight, many of your Instagram apps don’t work as they used to, or don’t work at all? This is happening because Instagram has changed its API in an effort to protect your privacy. It might came in as a surprise, but Instagram did announce this change, it only came sooner that anyone expected. 1. 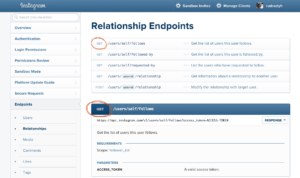 What Is The Instagram API? 2. Why Did Instagram Decide to Change Their API? 3. What Does Instagram Changing Their API Mean to You? 5. Overall, this is a good thing. What Is The Instagram API? All these changes might be confusing. Especially if we don’t know what is API and how does it work. API, short for application program interface, is a way for applications to interact with Instagram. It allows apps to create features for scheduling, commenting and analytics. Why Did Instagram Decide to Change Their API? Instagram decided to restrict third-party tools that used their API. Why? Because, in the past, a lot of third-party tools took advantage of the data they had access to, through APIs. And some other tools allow users to be spammy. So, because of these cases, Instagram decided to restrict all third-party tools. What Does Instagram Changing Their API Mean to You? If you are using some tools and apps that are connected to Instagram, you could notice that they aren’t working like they used to, or they don’t work at all. Maybe you are using apps that are following or unfollowing for you, also apps that like Instagram posts for you. Now, those apps don’t work anymore. That means that overall engagement on Instagram is lower than usual. Also, the apps that can analyses your Instagram followers, or someone else followers, aren’t working ether. One more thing that regards private users, is that they won’t be able to post or delete comments using third-parry apps. They can only do it from Instagram API. If you want to use community management features, you have to have Instagram business profile. When Instagram changed their API, it made it harder for brands to find influencers on the network. So now, influencers have hard time making them selves visible to potential partners. Influencer can swich to their accounts to business accounts, because Instagram is planning to have API that allows access to information on business accounts. Overall, this is a good thing. Instagram API has prevented third party apps to get their hands on private data, for private, non-business users. For brands, this is positive. Since no one can like and follow for you, now you know that all engagement is genuine, and that helps you to have better and positive relationships with customers.